I’ll skip lightly over the meeting in Dublin, since that’s business as usual in my professional life. 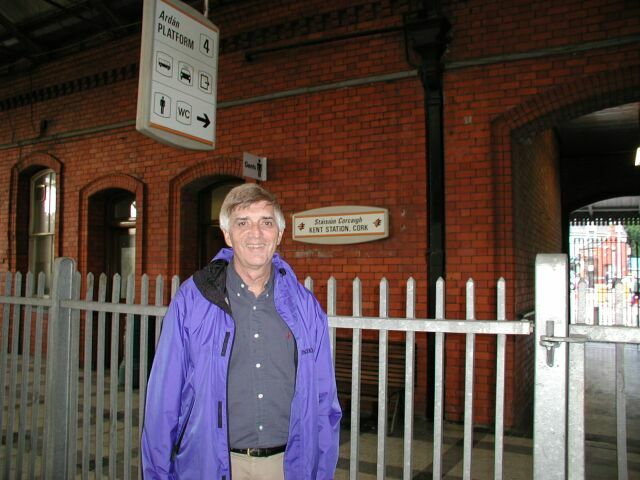 I had never been to Ireland before, but Dublin seemed similar to a largish English city. The weather on arrival was rainy, and on that day I had my only free time. I walked from my hotel on the outskirts about a mile into the central portion of Dublin, where I strolled a bit in the pedestrian zone, seeing the familiar McDonald’s, Burger King, Subway, and so forth. On the way I ran an obstacle course of umbrella jabs, but I also saw many people dressed like me with hooded rain jackets. Their expressions seemed stoical, like this pouring rain is the usual weather and it’s just another average day in Dublin. It was a bit depressing. I was most interested in walking around Trinity College, the most famous educational institution in the country. I had coffee and a snack in what seemed to be their student union. Two minor notes of interest – I learned that as late as in the mid-1960s catholics could be excommunicated for attending Trinity. Now they make up the majority of students. The other point of trivia was that the movie “Educating Rita”, in which Michael Caine plays a Cambridge professor who takes under his wing an uneducated woman, was filmed here at Trinity. Apparently, Trinity looked more like Cambridge than Cambridge did. Anyway, I went to my meeting, took notes on a borrowed computer, grudgingly used up precious battery capacity in my camera by taking digital pictures during the meeting, and then presented an illustrated summary at the end. There was a dinner at the renovated Guinness brewery and a visit to the new Media Lab Europe. But I’ll breeze by that in spite of the important professional things that I learned. I love trains! Too bad they’re not more useful in the United States. You can see my handlebar bag, which served as a carry-on. On the table are some of my Ordnance Survey maps, the case for my digital camera (actually, the case is one of those airline giveaways), and a few printouts of map pages that would be put in the map-holder when the handlebar bag was mounted on the bike. The ride to Cork took a little over three hours, with only a couple of stops as we neared Cork. 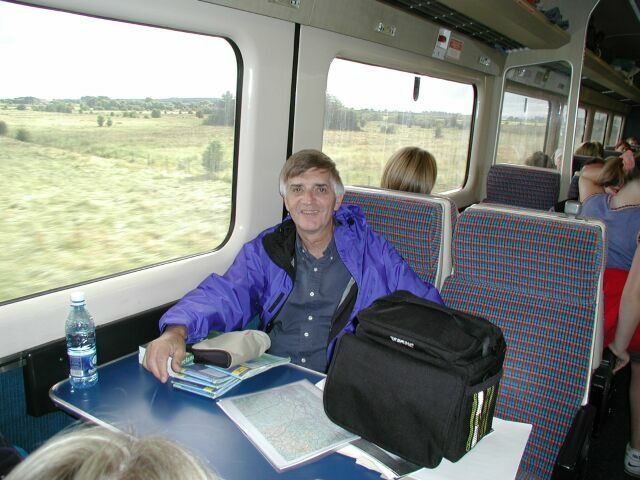 You can see the countryside out of the window, and it was like this all the way – flat, rural, and empty. We never went through any towns, and even at the few stops it seemed like there wasn’t a town. No one got off the train until Cork, which was the end of the line. As I watched the passing scenery, I was thinking, “Hey no problem biking this terrain.” Of course, I was being deceived. The immediate landscape as we left the station was pretty depressing – bleak, worn, and industrial. It was a few blocks to one of several bridges that spanned the rivers coming together at Cork – sort of a mini-Pittsburgh. I was constantly amazed at how empty this country was. Although Cork was a moderately large city with a population of 120,000, this was the second most populous city in the Republic. Dublin has a little over a million, but after that there isn’t much. Our final city, Galway, was the third largest, and it only has 60,000. There are many more Irish in the United States than in Ireland. I suppose a lot of that had to do with the potato famine. Len asked about four or five more people where our hotel was, and we slowly closed in on it, lugging our stuff as we walked. I thought we had found it one time when we came up to a largish and nice-looking hotel entrance at about the right place, but since the marquee simply said “Hotel”, there was no way to tell what hotel it was. Inside we got redirected once again, and it only took about two more inquiries to find our hotel, which was alongside one of the quays. It was nearly 9:00pm, but sunset wasn’t until about 10:00pm in this Irish latitude. I checked into my room, which turned out to be a little strange as it had three beds, none of which looked inviting. I chose the double bed, but as I tossed and turned later, I discovered that the sheet was significantly shorter than the bed. At least I had a nice view across the river from my room. We asked the friendly clerk at the desk about a restaurant recommendation and also where we might find a pub with traditional Irish music. She directed us to Clancy’s, where she said that the restaurant upstairs served the best food around. As we walked out the front door towards Clancy’s I turned my GPS on for the first time in Ireland, hoping to see that my bike route would be displayed. I couldn’t check this in New Jersey, because, being exactly 3123 miles from my home in New Jersey to Cork (so it said), the bike route I had uploaded wouldn’t be visible until I got within range. The GPS took its usual time finding the satellites, and was temporarily confused, thinking that it was still in New Jersey. I told it I was in Europe, and it said, “Ah ha!” And suddenly there was the squiggly line on the display, showing my intended path the next morning out of Cork. 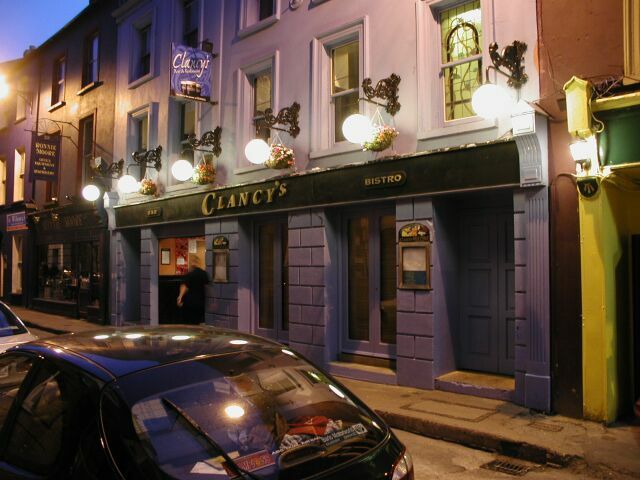 It was really nice having dinner at Clancy’s on the eve of our bike trip. The food was quite good, as it was everywhere we went – but then we always chose the best restaurants and enjoyed our leisure over dinner with wine. I had duck, which seemed to be featured on menus everywhere and made it easy for me to avoid beef. I reasoned with myself that the chances of being affected by mad cow disease by beef were negligible. But still – several doctor friends in New Jersey had said that they wouldn’t eat beef in Ireland. I told myself that it perfectly ok to eat beef, but then I never did. Maybe I didn’t convince myself well enough! The hotel clerk had told us that Clancy’s had music, but that it might be rock. She recommended another pub across the river for Irish music. While we ate dinner upstairs, we heard the band making tentative noises downstairs, and about the time we finished they began making a lot of noise. It was good rock music, as this goes, but we thought we could get that anywhere, and we went off in search of the other pub where we might hear something more typical for Ireland. As the days went by we learned a lot more about the custom in Irish pubs. The music invariably starts at 9:30pm, but they’re always slow about it, so that it often takes another half hour to gear up. The bands move around from pub to pub and city to city, and even the locals don’t usually know who will be where when. Some pubs feature a particular kind of music, but others have a mixture – one night might be rock, another folk, another traditional. On this first night we were uninformed about a lot of things. 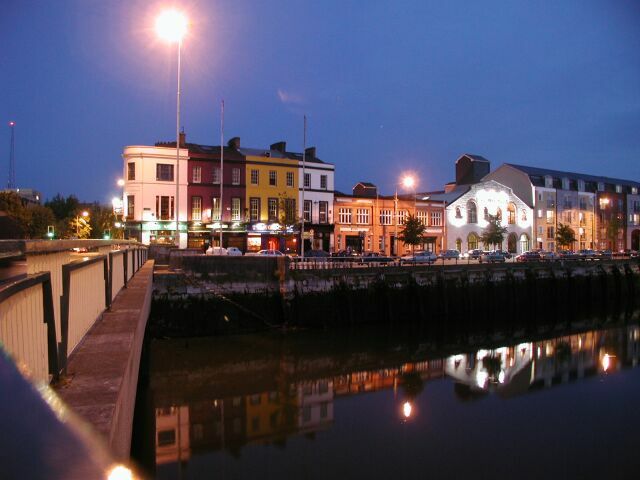 As darkness fell in Cork the city transformed itself. In the daylight it had seemed dingy and industrial, but at night it turned lively and festive. Pubs were everywhere, and we heard music echoing down the streets. Smiling people milled on the streets, and many pubs had open doors with people standing outside drinking their pints. The air seemed even warmer than during the daylight hours. Typically the temperature range each day was fairly narrow, for example it was often something like a high of 59 degrees and a low of 53. While it wasn’t very warm during the day, by comparison the nights often felt comfortable. Because of this climate, no hotel in which we stayed had air conditioning. We crossed the bridge shown in the picture, looking for the recommended pub on the facing street (I think the second from the left in the picture). But even halfway across the bridge we could begin to hear loud rock music vibrating the windows in front of us. I was almost of a mind to give up and try to get a good night’s sleep before biking, but we halfheartedly began walking down the street sampling some other pubs. 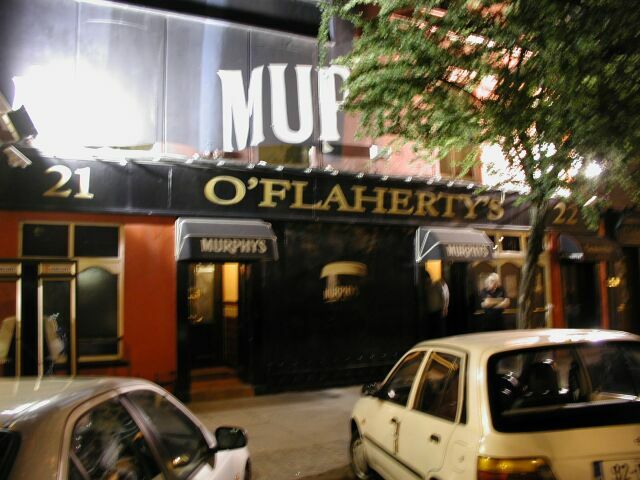 We walked into O’Flaherty’s, a pub that had seemed quiet from the street, and by chance came upon the best music that we were to hear during the trip. O’Flaherty’s was packed. Every pub we were ever in was packed – some so much so that you couldn’t move. There were only a relatively small number of seats at tables, and nearly everyone was standing. All age groups were represented. In fact, we often saw children in pubs as late as 11:00pm. Everyone was drinking pints of beer, which was mostly dark, like Guinness. Len and I, by contrast, settled on glasses of Smithwick’s (pronounced “Smittick’s”). I thought maybe that I would look like a wimp, drinking small glasses of lager, but no one ever seemed to notice or care, and no one seemed to push refills either. Moreover, it was even hard to buy refills with the crowd at the bar. The bartenders, who sometimes were just young kids, just kept pouring beer as fast as they could. It was fairly smoky, but not overwhelmingly so. The band in O’Flaherty’s was on a slightly-raised platform near the entrance. In most of the other pubs we visited the band didn’t have any kind of a stage at all, and often just sat at tables among the other patrons while they played and sang. But O’Flaherty’s had an unusually elaborate setup in comparison. There were five members of the band, who played guitars, banjo, violin, and keyboard. The music they sang was a mixture of Irish ballads, together with more familiar folk and instrumental Irish dance tunes. While there was some part of the crowd toward the back of the room that seemed to be ignoring the music, the front crowd was mesmerized. People swayed, joined the singing for the traditional songs, and clapped their hands over their heads in time to the music. There was a kind of one-ness in the room that was very palpable. And we laughed through the smoke and smell. I believe this song is actually about Belfast, but it has that heartfelt sadness that echoes through many of the Irish ballads. Len and I were standing in the front row, only a couple of feet from the musicians. Standing next to me was a spectacular young woman, perhaps in her mid-20s. She was a tall blonde, dressed in a black leather miniskirt and a scoop-neck, sleeveless undershirt. She had an incredible figure with an extremely small waist. In spite of her relative height, she had very high heels, and her blonde hair flowed halfway down her back. She also had a pretty face, but when she turned and smiled, the only thing I noticed was the crooked teeth and the gap where one was perhaps missing. Len remarked later that it was such a shame that she probably couldn’t afford the $500 or so for a dentist that might have transformed her appearance. On the other hand, she may have spent more than that on her clothes. It was hard to take my eyes off her. She seemed oblivious to her surroundings as she swayed in a state of entrancement to the music. She was with another young woman who was even taller, but who was on the heavy side and had very peasant-like looks, if I could use such a description. I was a little torn as to whether they were a lesbian pair, or if not, whether I should feel sorry for the heavy one who had to be in the shadow of such an exceptionally attractive companion. I was a little surprised that during the couple of hours we were there no one tried to hit on the blonde, but from what I saw in other pubs, the atmosphere was more of a convivial social gathering than any place where people went for pick-ups. Behind me was a pie-eyed Frenchman. He was in his mid-30s, and sweat gleamed from his face. He looked like he had been drinking all day. His eyes bulged and he had a plastered, what-me-worry grin. Several times he tried to talk to us, about where he was from in France and some visit to the US, but I couldn’t understand much of what he was trying to say. Len thought he was really scary. I thought maybe he was just a drunk idiot. I was wondering who these people were in the daylight hours. I got the feeling that they had mundane jobs in nondescript establishments where they were invisible people. But after dinner they would change clothes, appearance, and personality. It was pub time; the city rocked. It was a magical night for Len and me to experience the musical conviviality. There were a couple of songs that I remember particularly, because I was to hear them again and again in other pubs in other cities. Len was especially familiar with “Black Velvet Band.” This was one where the audience at the pub joined the singing for each of the choruses. The song is another one about Belfast, and is about a man who is framed for a crime he didn’t commit by a woman wearing a black velvet band in her hair. In the song he warns others to be on the lookout for the woman with the black velvet band. Well, I’m sure that’s enough about one night in one pub! I’ll end the episode here, but it’s a flavor that I want to convey. That kind of thing was a big part of our trip.